A few years ago, I was part of an iPad Scout as our school district made decisions about how best to implement a 1:1 initiative. 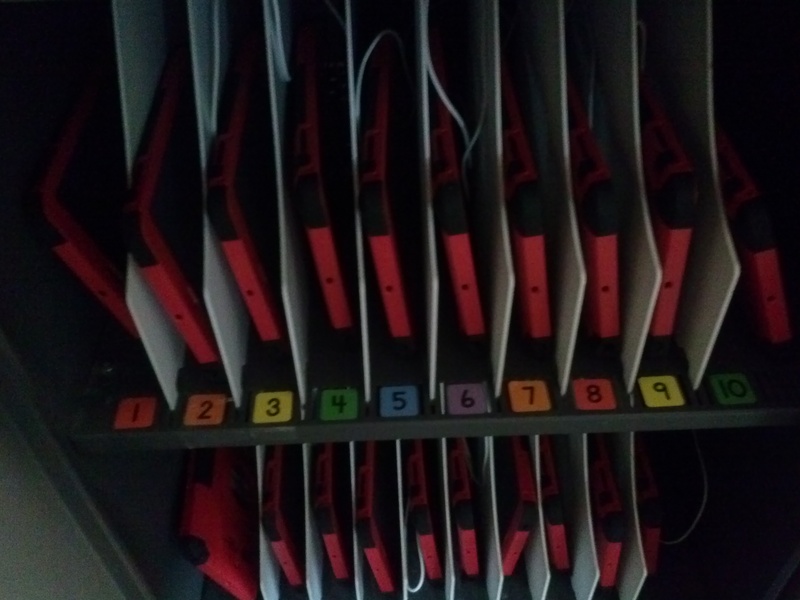 Since then, they decided to go with iPad Minis for everyone (well, except for K this year, who is utilizing the iPad 2s the teachers used to have), and now it’s finally first grade’s turn!! Since we’re a little ahead in Rm. 202 technologically speaking (partly because of my scout experience), we were the first class to get our Minis! Check out the faces here–they say it all! Ok, but I’m getting ahead of myself…there was much work that happened before we could take this picture. Let me explain. As a member of our district’s Technology Leadership Group, I have the opportunity to learn and grow with other tech-minded friends, and share resources for our tech-learning journey. 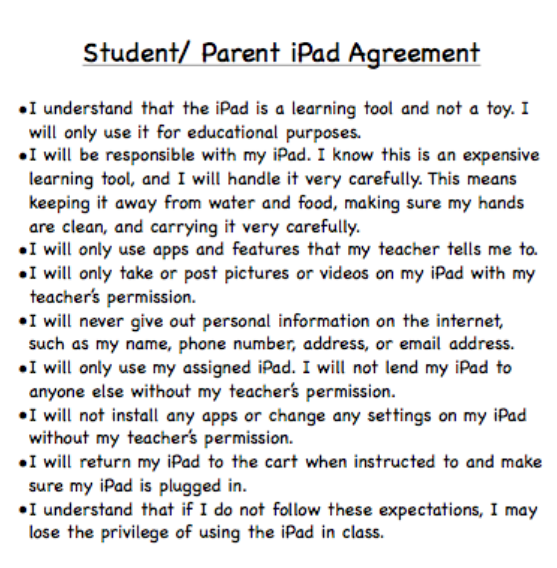 So as I got started with iPads in 1st grade (which is very different than getting started with them in 5th grade! 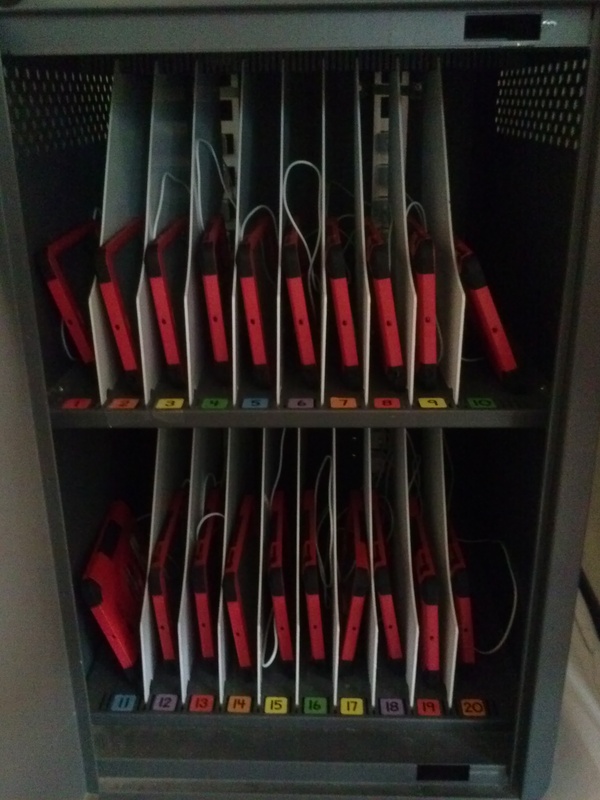 ), I was glad to have help from my friend Jen Bartin, who has had several years of experience with using them well in 2nd grade. She shared her version of iPad Boot Camp, and it was just what we needed. We spent the rest of the day learning some logistical things, like turning the iPad on and off, using the lock button for the screen, creating shortcuts to some important places on the home screen, and turning off the clickety-click sounds the keyboard makes. 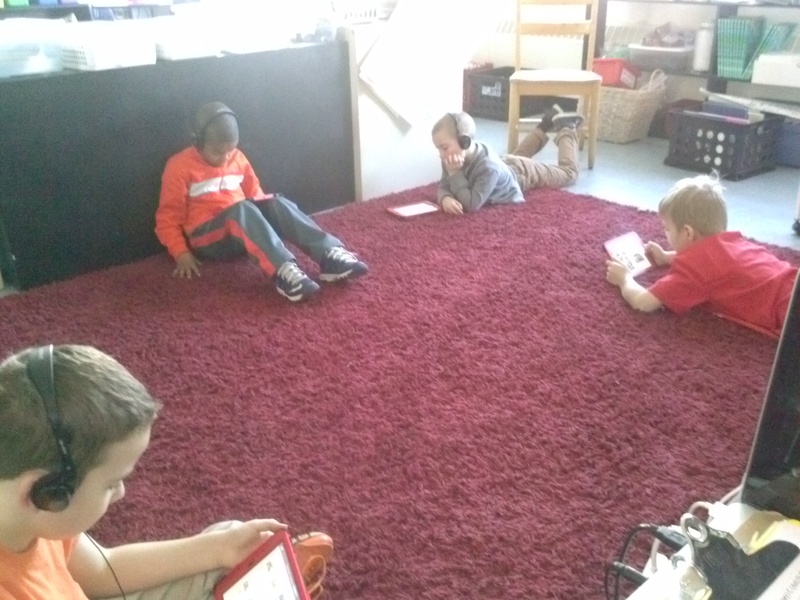 While it is really important to me not to be solely app-focused, there are some good ones that we will use often, like Raz-Kids, which we have been using already on our class iPads and laptops. This was an easy one to get them going on and is a great way to build our reading skills. We also learned how to use the Kidblog app (which is a little different than the way the website works) to work on a post related to our history study in Social Studies. 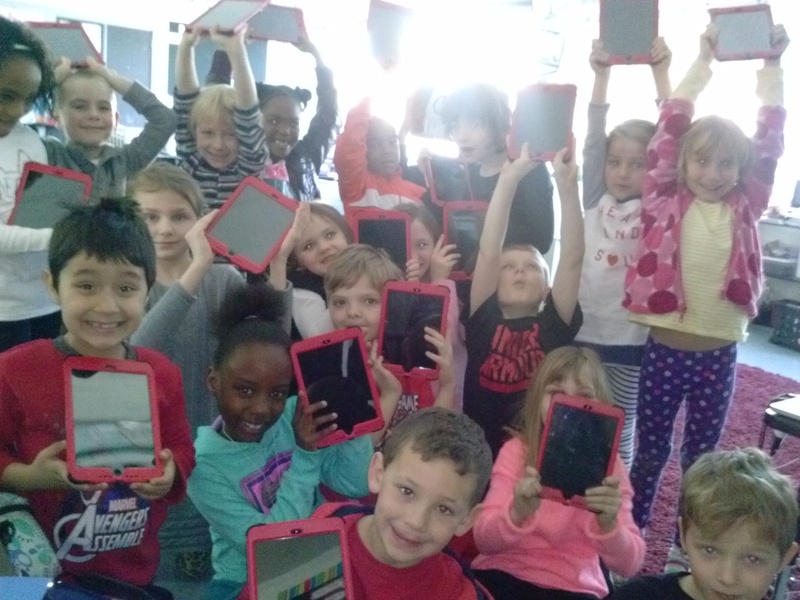 Dreambox–another app we use regularly–is also our iPads and we checked it out before we had choice time. It’s not usual that we’re all doing the same thing at the same time, but hey, if we want to, now we can! Kids checking out Raz-Kids on Thursday! 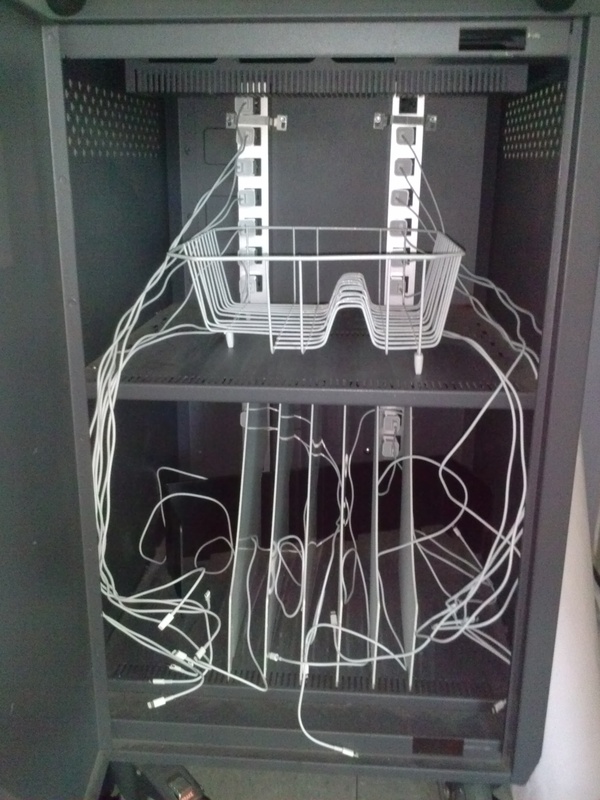 I know it looks like a big jumble, but the idea is that every cord (which are all already labeled for each kiddo) is in order and will be available for kiddos to pull out easily. Right now (until I buy another tray) there are 13 on the top and 7 using the dividers that were already there. It seemed like a great idea. 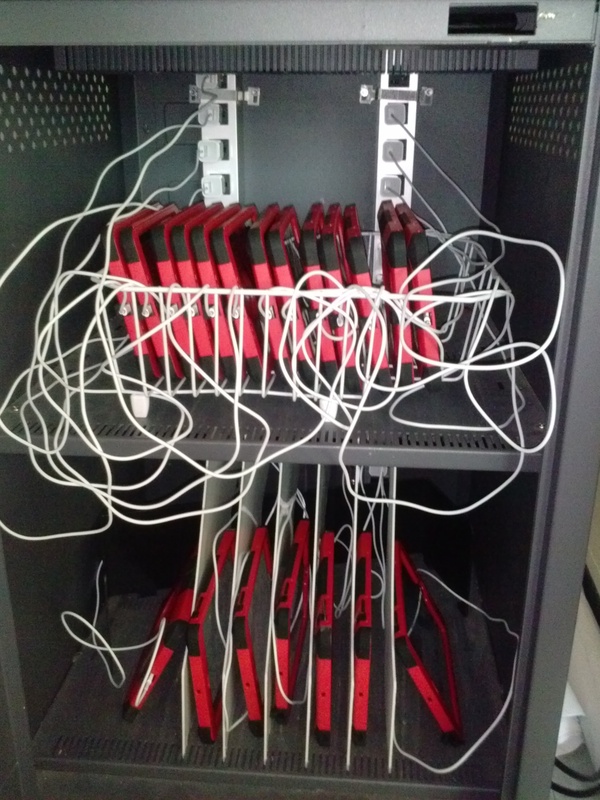 UPDATE: After a suggestion from Jen Bartin (remember her smart ideas for iPad Boot Camp?) and a reflection on HOW LONG it took to put them away that first time, I decided to chuck the whole “dish drainer” idea and just use the dividers. And it didn’t actually take as long as I was told to put them in. It works better and boy is pretty! What do you think?